Bar2Bar 5K, Sunday March 15th AND Potluck! Bar2Bar 5K is March 15th, 1pm! This is not our event -- but everyone is welcome! We plan to attach ourselves to this has a hash-event (likely no circle), where we'll promote Hashing and specifically the CRapidsH3 Kennel. I have business cards with this web address and an email to reach me. The actual Bar2Bar event link is below. NoNameTeri has graciously allowed us to use her house for pre-gaming and dropping off potluck for after the "run." It is ridiculously close to the start of the Bar2Bar. You can drop off drinks or food anytime after 9am on March 15th. NN-Teri will be there most of the day, so you can drop things off during the Bar2Bar run as well. 9am or after - drop off potluck dish at NN-Teri's. 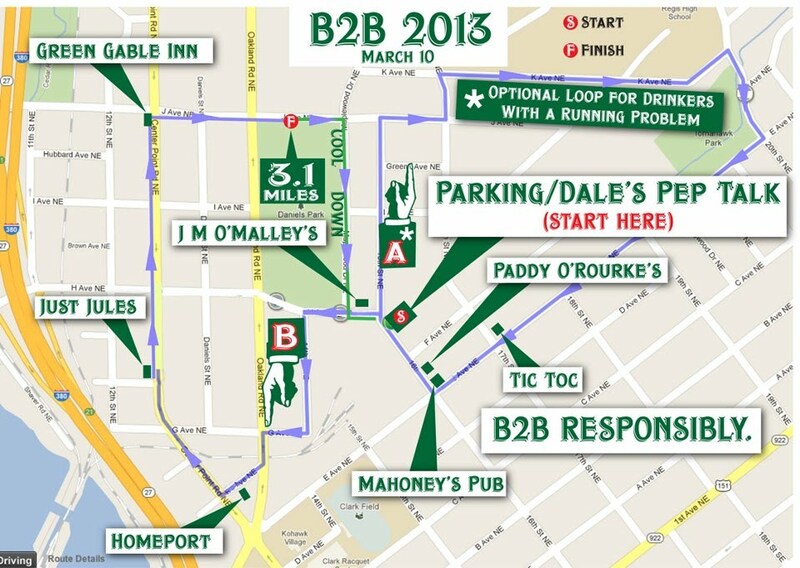 1pm be at beginning of the Bar2Bar run! 9am - 12:45 : Drop off potluck at NN-Teri's (if participating). 11:00 - 12:30 (option 2) : Irish Democrat has been suggested for pre-game food. Then head to NN-Teri's or the Bar2Bar start based on time. 1pm - 5pm(ish) : The Actual Bar2Bar "run." See Map & link below. Note optional runner's loop. Note, most of us will likely skip the last bar (Green Gable Inn) and head straight to NN-Teri's. 5pm or when we get there: Potluck at NN-Teri's. Put some food in that beer-filled-belly!